Ethiopia and Djibouti have traditionally maintained a close political and economic relationship out of mutual necessity. When the Ethiopia-Eritrea border war broke out in 1998, Ethiopia lost access to Eritrea’s port, an existential crisis for a landlocked country. Since then, Ethiopia has overwhelmingly relied on Djiboutian ports to process its imports and exports: some 95 percent of Ethiopian imports transit through Djibouti. Djibouti, too, relies on its larger neighbor, from which it imports freshwater and electricity. Profits from Ethiopia’s use of Djiboutian ports—estimates top $1 billion annually—are a key source of Guelleh’s government revenue. But Ethiopia finds this arrangement deeply flawed, and is interested in more diverse, and better, deals for port access. The United States, as well, is deeply dissatisfied with Guelleh’s partnership. Specifically, his penchant for extracting costly rents from as many foreign militaries as possible, including allowing a Chinese military base just kilometers from the US one, has left the United States discontented. Djibouti’s shipping and land lease profits directly supplement Guelleh’s tight political control over the country. The Chinese will reportedly pay $20 million a year until 2025 for their base, though that figure does not include more than $1 billion in Chinese loans. The Americans pay some $70 million annually for at least another six years, and the French pay another $30-plus million yearly for their military facility. These profits contribute to what appears to be a booming economy: Djibouti’s annual GDP growth is expected to remain around 7 percentinto the near future. 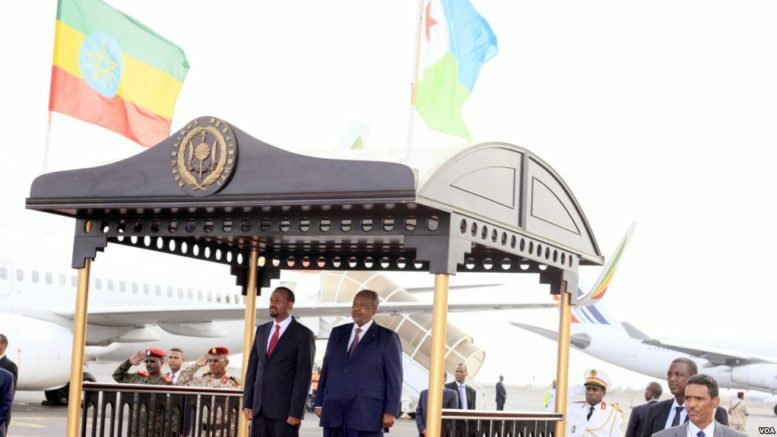 But despite Djibouti’s ostensible riches, most of the country remains desperately poor, underdeveloped, and subject to Guelleh’s authoritarianism. Nearly a quarter of the population lives in extreme poverty, and Djibouti ranks abysmally on political rights and civil liberties. In recent years, the UAE’s increasing interest in the Horn of Africa adds a new complication to Djibouti’s predicament. The UAE has acquired rights to a naval base in Eritrea, a military base and commercial port in Somaliland, and a multi-purpose port in Puntland. But relations between Djibouti and the UAE have been fraught since February 2018 when the Djiboutian government cancelledthe contract of Emirati firm Dubai Ports World (DP World) to operate Djibouti’s main container shipping terminal. Early reports suggest that the UAE might have even played a role in the rapprochement between Ethiopia and Eritrea. The UAE’s growing partnership with Ethiopia—which recently acquired a 19 percent stake in the Berbera port alongside DP World and Somaliland—is also noteworthy evidence of regional diversification.